Scientists in the Center for Nanoscale Materials and Argonne's Biosciences Division have demonstrated a remarkably simple, elegant, and cost-effective way of assembling nanoparticles into larger structures of any desired shape and form at will via a process called "optically directed assembly." Optically directed assembly (ODA) involves suspensions of gold and carbon nanoparticles in water. 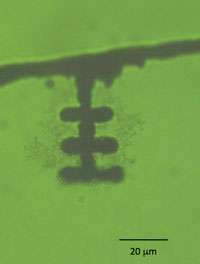 A small droplet of the suspension is placed on a glass slide, and a low-power laser is focused onto a small region within the droplet near its surface. Through a complex process involving optical trapping, heating, evaporation, convective fluid flow, and chemical interactions, the nanoparticles fuse near the laser focus and as the experimenter moves the laser focus around in the droplet, a continuous filament of the fused material follows. Gold-carbon nanoparticle interactions. (a) TEM image of the tip of a gold-carbon filament; (b) TEM image of encapsulated gold nanoparticles within the tip; (c) Initial gold-carbon nanoparticle configuration for a molecular dynamics simulation; and (d) molecular dynamics result after 10 ns showing wetting of a gold nanoparticle by carbon atoms in the 450K range. 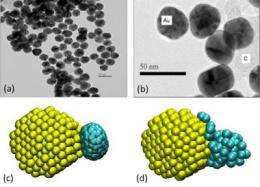 These results indicate the possibility of encapsulation of gold nanoparticles by carbon. Irreversible metal-metal aggregation is observed only when carbon is present. Scientists in CNM's Theory & Modeling Group used molecular dynamics simulations to model gold-carbon nanoparticle configurations and wetting behavior.